Home » How to Backup Blu-ray DVD Movies to NAS and Stream to PS3 Playing? With the help of DLNA and DLNA certified devices, life in the house becomes more interesting and more convenient. I believe most people are not so familiar with DLNA, but you must have contacted with it. Since more and more digital entertainment devices have been developed and pushed into the market, home is not just a place you live any more. You can play games on the big screen, communicating with your friends on the Internet and even watch HD movies with different devices in the house. These movie playing devices contains mobile phones, tablet PCs and other media players. DLNA comes as an allowance to combine these devices together and share media files with each other. So, do you want to play Blu-ray DVD movies through home LAN with the DLNA certified devices like PS3? To enjoy Blu-ray DVD movies on PS3 through NAS, you need to backup Blu-ray DVD movies to NAS and then you can stream Blu-ray DVD movies for PS3 playing. 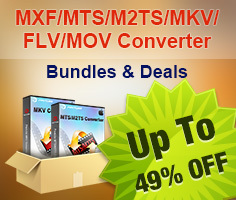 Which video format is the best choice for you to rip Blu-ray DVD movies to PS3 playing? According to the research, AVI videos can be steamed to PS3 playing with 5.1 channels through DLNA. So, before copying Blu-ray DVD to NAS, here I recommend you rip Blu-ray DVD movies to AVI for streaming to PS3 playing. Pavtube Blu-ray Ripper is just a Blu-ray to PS3 video converter which helps you rip Blu-ray DVD movies to PS3 playing through home LAN. Step 1: Put your Blu-ray or DVD disc into the ROM and launch the Pavtube Blu-ray to PS3 video converter. Click add from Blu-ray ROM button and import Blu-ray or DVD movies to the program. 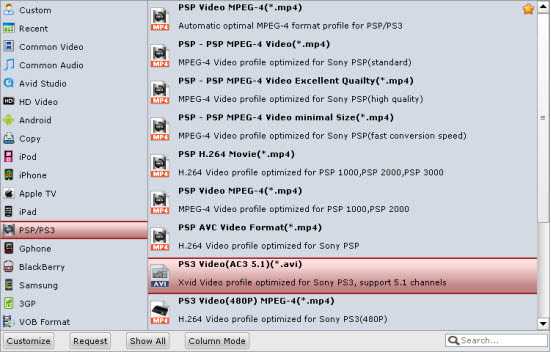 Step 2: Click format bar and choose PSP/PS3 >> PS3 Video (AC3 5.1) (*.avi). If you can not find this option, you may need to check and upgrade the program to the latest version of Blu-ray Ripper. Step 3: Click the convert button and start to rip Blu-ray DVD movies for PS3 playing through home LAN. Step 4: Copy converted AVI videos to NAS and then start the PS3 to search the media resource from NAS. When the movies are displayed on the list, you can directly play them with ease.